A happy customer is usually a loyal customer and is also someone who ends up referring business to you as well. In other words, look after your customers and they will look after you. That, of course, is a rather well-known business adage, which is why it is so suprising that so few companies use blogging tools as part of their customer service. 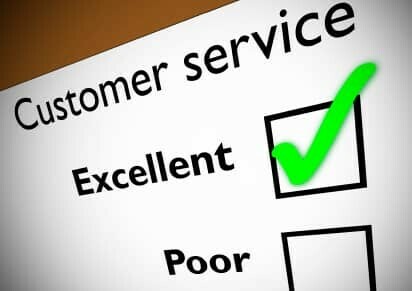 Do you want to be rated excellent for your customer service? Many companies merely use blogs to provide news or opinions relating to their products and services. But there are a myriad of ways you can use blogs in your organisation – and customer service is a prime example where many companies are losing out. For instance, if you provide a service-based business you could establish a private blog for each client. On that blog you keep them up to date with the progress on projects or you could use it to answer questions or deal with issues as they arise. In other words, a central communications centre for each specific client. Similarly, you could use blogging software to provide superior levels of customer service in the retail sector. For instance, when you buy new furniture it takes about six weeks for it to arrive. Why? Because most furniture is built to order and is rarely “in stock”. One your order is placed in a furniture store, wouldn’t it be great to be given a personal blog that updates you with progress on the build of your sofa? You could also use the blog to add comments or questions, perhaps even change the colour of the upholstery at the last minute. The problem with many businesses is that they do not communicate enough with their customers directly. As a result, they feel left out, become less connected to that business and are therefore less likely to be advocates for the company. Personalised blogs for specific customers, or groups of customers could enhance customer service, increase the feeling of connectivity to your organisation and thereby raise your chances of future business. Few businesses appear to think creatively enough about the potential opportunities that technology can bring. People are still deriding Twitter and saying things like “it’s not really a business tool”, leaving the creative thinkers at Dell, Starbucks and Zappos to make millions of dollars using it. The same is true with blogging; it is perceived as a means of people writing their views online. Yet all it actually provides is a means of communication – rather like pen and paper. It’s what you do with the tool that counts. Think more creatively and you will come up with several different uses for blogging software within your business, many of which will enhance your customer relationships. It’s time to stop thinking of blogging as blogging…. !